Michael Vincent's glass floral pendants all have the color and detail of the gorgeous real-life versions. 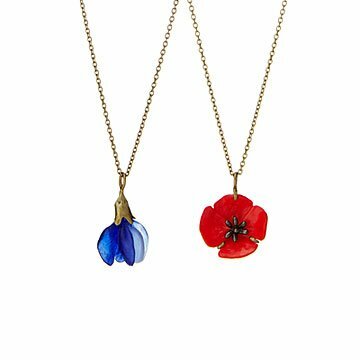 Transcendently romantic and botanically realistic, Michael Michaud's glass floral pendants are made from molds cast using real blossoms. Often painted by Monet and Van Gogh, brilliant scarlet poppies may be the world's most popular wildflower. Blue false indigo, Native to the North American prairie, was coveted for its intense shade by Native Americans and European settlers who used it to dye fabric. Both come vividly to life in Michael's detailed designs. Handmade of bronze and glass in Connecticut. While studying under designers Hans Christenson and Gary Griffin in the Rochester Institute of Technology's Art and Design School, Michael Michaud became highly skilled in creating and working with molds. After graduating, he continued to perfect his craft while employed by jewelry designers in New York City. Working in the flower district and living in the Connecticut countryside inspired him to begin creating botanical jewelry. In addition to being featured in museums, galleries, and speciality retailers around the world, his exquisitely detailed work has been commissioned by The Victoria and Albert Museum, The Art Institute of Chicago, The National Gallery of Art, and the Château de Versailles. Michael currently lives in Fairfield, Connecticut with his wife and children, and crafts his handmade jewelry in New York City.